St Mary's is situated in the south-east corner of the castle grounds. The castle is said to be one of the finest examples of a Roman fort in much of Europe. 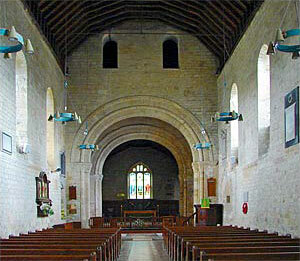 The Church is an old Augustinian priory chapel, built in the twelfth century. The Augustinian Canons moved to the village of Southwick by 1155 due to lack of space; they built the priory which was one of just six Augustinian priories in England at that time. The nearest station is Portchester. It is a pleasant if lengthy walk due south to the castle entrance, following the brown tourist signs. 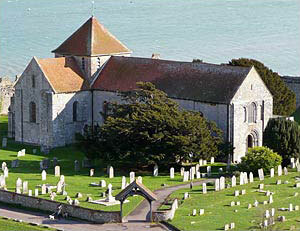 The Church is well signed by following the brown Tourist Signs to Portchester Castle. From the east, join the A27 trunk road, and turn off at Cosham (just before the A27 becomes the M27) and turn slightly right at the roundabout, following the signs to Portchester. After passing open water on your left, turn left at Castle Road where there is a roundabout and brown tourist sign. From the west, join the M27 and turn off at Fareham, junction 11. Head south on dual carriageway signed Fareham, and take the first slip road off. Turn left and follow the signs to Portchester, turning right at Castle Road where there is a roundabout and brown tourist sign. At the end of Castle Road there are two car parks which are free. Click for a Portchester street map that you can print. The Church has level access for wheelchairs.